The Legend of Zelda: Spirit Tracks​ (ゼルダの伝説　大地の汽笛, Zeruda no Densetsu Daichi no Kiteki?, lit. "The Legend of Zelda: (Train) Whistle of the Earth") is an action-adventure by Nintendo for the Nintendo DS. Nintendo president Satoru Iwata announced the game at the 2009 Game Developers Conference and set its release date for late 2009. The game features a cel-shaded art style similar to that of The Legend of Zelda: The Wind Waker and The Legend of Zelda: Phantom Hourglass. 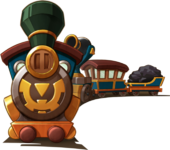 Spirit Tracks' protagonist, Link, can travel across the game's overworld using a cannon-equipped steam train, much like the steamboat in Phantom Hourglass. Link is also able to control a Phantom, one of the enemies from Phantom Hourglass. Spirit Tracks takes place about a century after the events of Phantom Hourglass. 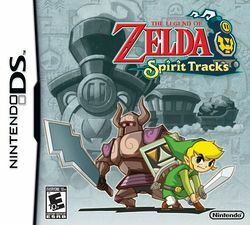 Spirit Tracks is set in the land of New Hyrule, the land that Tetra and her pirate crew from Wind Waker and Phantom Hourglass set out to discover and settle, to replace the Hyrule of old that was lost in the Great Flood. Many years ago, the people of the land of Hyrule lived in happiness and prosperity, following the Spirits of Good, who protected them from harm. But, this was not to last. The evil Demon King rose to power, and began to terrorise the land and its people. The people prayed to the Spirits for help, who came down and engaged in a long and bloody conflict with the Demon King. But his power was too great. It quickly became clear that the Spirits could not defeat the Demon King. All they could do was subdue him. They built a tower to hold him, and held him in this prison with chains that were spread all across the land. With the Spirits' power exhausted, they returned to the heavens, leaving behind their servants, the Lokomos, to watch over the land and its people. With the land now bereft of both spirits and demons, the people rebuilt the land, and returned to their lives of happiness and prosperity. Over time, the tower that held the Demon King became known as the Tower of Spirits. The chains that held him down became the tracks for a new technological marvel, the steam train, and became known as the Spirit Tracks. This page was last edited on 13 February 2017, at 05:48.